Though yams and sweet potatoes are normally associated with Southern cooking and they have a long growing season, some varieties can be grown in the Northwest. Denison Farms at the Corvallis farmers' market and Ayers Creek Farm at the Hillsdale farmers' market in Oregon grow and sell yams. 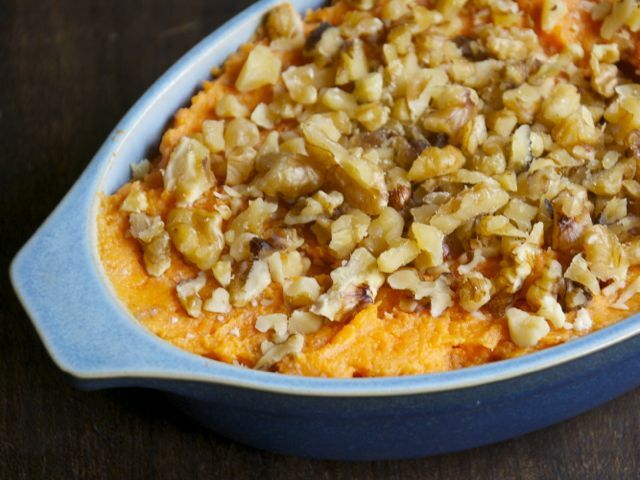 If you don't have or don't like yams, use winter squash. Mair Farm-Taki in Yakima, Washington, sells fresh ginger at the University District market in Seattle during the late summer and early fall. Blend the yams, orange juice, cream or soy milk, ginger, and salt in a mixing bowl. Place the mixture in a small oiled casserole dish. Bake for 30 minutes. Alternatively, you can heat the yam mixture gently in a small pan on the stovetop. Top with the walnuts and season with freshly ground pepper to taste.